Sitting just inches behind a modified Land Rover SVR, Denise Mueller of San Diego, California set a new women’s bicycle land speed record at 147 miles per hour on a custom-made bicycle. Sitting just inches behind a modified Land Rover SVR, Denise Mueller of San Diego, California, set a new women’s bicycle land speed record at 147 miles per hour on Saturday. 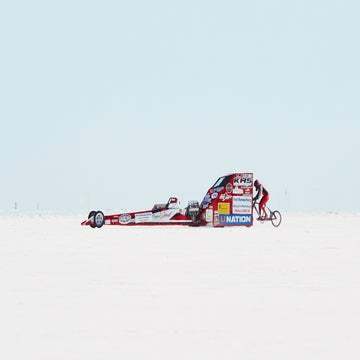 Mueller set the new women’s speed record at Utah’s Bonneville Salt Flats where she rode a highly customized bike built by Chris Garcia of SD Wheel Works with technical support from Da Vinci Designs and KHS Bicycles. The bike, which looks like a mix between a chopper motorcycle and downhill mountain bike, includes a long list of technical innovations. The bike has an elongated frame, steering stabilizers, a BodyFloat isolation seatpost to dampen vibrations and harmonics, as well as custom-built 17-inch dragster wheels with shaved tires. Perhaps the most impressive feature, however, is the bike’s two massive 60-tooth chainrings in a double-reduction or speed-multiplier system that allows Mueller to pedal at a normal cadence (approximately 102 RPM) while riding at 147 mph. When building a bike to withstand speeds of over 150 miles per hour, stability and smoothness are the main priorities. Every bump in the road or swerve of the bike costs speed and could cause a dangerous high-speed crash if Mueller gets knocked out of the pace car’s draft. “Hitting a 140 mph wall of air will knock me off my bike,” Mueller explains. So most of the bike’s modifications and features are built around keeping her pedaling smoothly within the draft zone. The bike’s 17-inch dragster wheels and shaved tires lower Mueller’s center of gravity, making her riding position more stable at high speeds. The elongated frame also adds steering stability at high speeds. The record-breaking KHS bike has a short travel suspension fork to dampen high-speed vibrations, as well as a steering stabilizer to eliminate speed wobbles. Mueller uses a BodyFloat isolation seat post that also helps dampen the harmonics and vibrations from the ground so she can pedal a smooth cadence and maintain optimal traction at speed. Using a double-reduction gear system helps improve drive efficiency and allows Mueller to maintain a lower, more stable riding position; the alternative would be a single, giant chainring that would sacrifice ground clearance. Mueller’s system sequentially links two drive systems with 60-tooth chainrings to create approximately 488 gear inches. (For comparison, a 53-tooth front chainring with an 11-tooth cog creates 127.1 gear inches on a typical road bike setup with 25mm tires). “At 488 gear inches, her cadence at 147 miles per hour would have been 102 RPM,” explains Todd Shusterman of Da Vinci Designs who custom made this system. Initially, Mueller’s bike was attached to the slightly-modified Land Rover SVR pace car, which towed her to approximately 90 miles per hour before she released the tether and continued to pedal behind the car. A tail fairing was attached to the Land Rover, creating a small pocket that shielded Mueller from wind resistance as she continued to increase her speed. Professional auto racer Shea Holbrook drove the pace vehicle with Mueller sitting just inches behind the car. The two planned to communicate through a two-way radio, but last-minute technical difficulties forced driver and rider to communication through head movements. Holbrook’s precision driving was an important piece of the record since any small acceleration or change of pace could disrupt the rider’s rhythm and speed. She attempted to top her newly-established record and to beat Howard’s speed of 152.2 mph just days after her original trial. “We fully expect her to beat 152 and maybe hit 155,” Howard said before the attempt. However, Mueller was unable to complete a full attempt, pulling off the pace car early before she reached her goal speed.